The Flash is not just another super hero television series being aired on The CW. The series is running its 2nd season and won praise and accolades from not just common people but also critics. It is the story of a man who is struck by lightning and wakes up after 9 months only to discover that he has received many super powers. Barry Allen aka The Flash starts to fight crime and criminals using his new found powers. After being declared a super hit action super hero series last year, The Flash has successfully entered into its 2nd season. The first episode of the 2nd season was aired on October 6, 2015 with the news that Captain Cold has been kidnapped and Barry has to forge alliance with Lisa, his sister. See the events unfolding in this exciting action packed television series. The Flash is not just extremely popular among kids but also older people. All these people keenly follow the antics of Barry Allen and his friends to see how they are able to fight the criminals and defend the innocent people of Central City. The fan following of The Flash is increasing with every new episode of season 2 being aired on television. 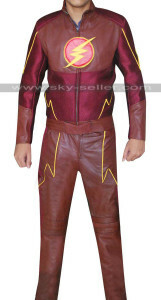 Small kids and teenagers are crazy about costumes worn by The Flash and other characters in this TV series. Some of the costumes that have become very popular are as follows. Man in the yellow suit seen in the television series The Flash is Reverse Flash. You can wear this beautiful jacket made from premium quality leather to hog the limelight at any social gathering and can give yourself a villainous look. It is a genuine leather jacket with a stand up collar and full front zipped opening. 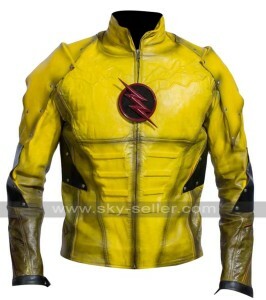 Black patches on the sleeves and the logo of the Flash on the chest make this jacket look very attractive. This is another of Flash costumes that has become a rage among young people these days. This costume is made up of a jacket and a matching trouser. The jacket proudly carries the logo of Flash at the front. While the pants are made of maroon colored leather, the jacket is a mix of leather and fabric. This is a beautiful costume worn by Jay Garrick. This leather jacket has a snap tab closure at the collar and it is made using premium quality maroon colored leather. Do you mind if I quote a couple of your posts as long as I provide credit and sources back to your blog? My blog is in the exact same niche as yours and my users would really benefit from a lot of the information you provide here. Please let me know if this ok with you. I simply want to say I’m newbie to blogging and site-building and seriously liked this web page. Likely I’m going to bookmark your site . You amazingly have superb writings. Many thanks for revealing your blog.